I gave a sampling of the online student response system Kahoot during the last faculty meeting. 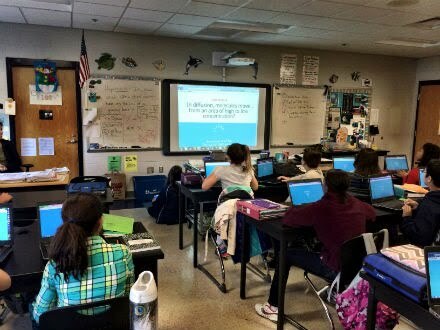 This was well received by those in attendance and I was happy to see that a large number of teachers have since implemented this great digital tool into their own classroom. Kahoot is a free online resource that allows teachers to create quizzes, discussions, and polls that students can respond to right from their laptop, cell phone, or tablet. The beauty of Kahoot lies in the fact that students must not only get the answer right, but must do so in the shortest amount of time. The top 5 names are displayed for the class to see after each question, and it can be anyone's game until the last question. Once the session concludes, the class has one final overall winner. Even though only the top 5 scores are displayed for the class to see, the teacher has access to the data and final results of each individual student. "A year 9 class at ratton School in Eastbourne are playing Kahoot!. The camera focuses on one of the players in the game answering a question (displayed on the screen at the front of the class) on his iPad. Students Kahooting in Mrs. Humphrey's Class! He waits anxiously for his fellow classmates to all answer (or the timer to count down to zero) to see if he was correct. When he finds out he is, there is sheer joy in his face and body language. That is until he realises that he still isn’t in the top 5 scorers in the room and therefor his name isn’t displayed on the scoreboard at the front of the class. He’s now motivated even further for the next question." Video of a Student Kahooting!